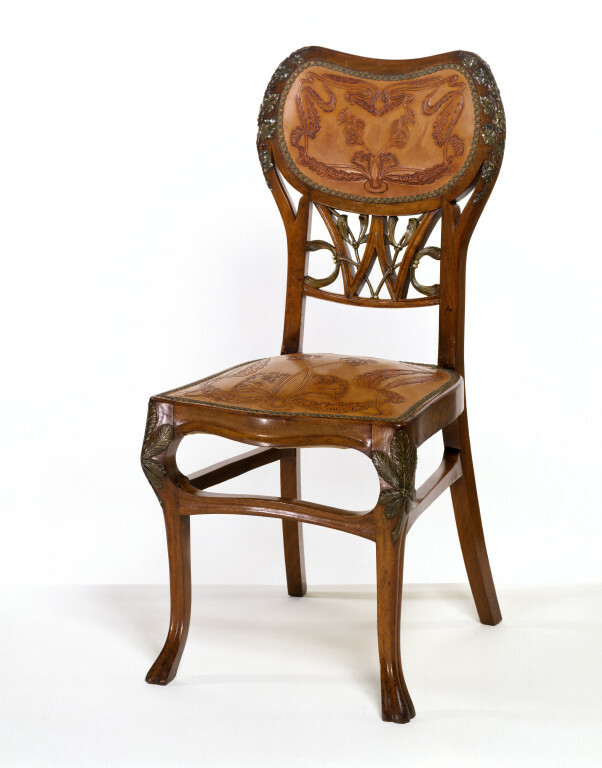 This chair was exhibited at the International Exhibition in Paris in 1900, which established Art Nouveau as the dominant modern style of decoration throughout Europe. The complex, flowing lines of the chair are typical of the style, as are the formalised motifs on the leather panels. The use of chestnut leaves, mistletoe and sprays of ivy, shown in a much more realistic fashion on the legs and back, was less typical of the style. This may have been a speciality of the maker, A. Darras, about whom very little is known. The walnut frame is robust, but the original leather panels suffered from ‘red rot’, which made them crack and disintegrate into a red powder. The current panels were remade in the V&A, following the original design. A chair of carved walnut, partly painted green, the seat and a panel in the upper back are reproductions, based on the original panels. They are of cut and punched brown leather, fastened by star-shaped, brass-headed nails, the design on the leather showing poppy heads and whiplash foliage. 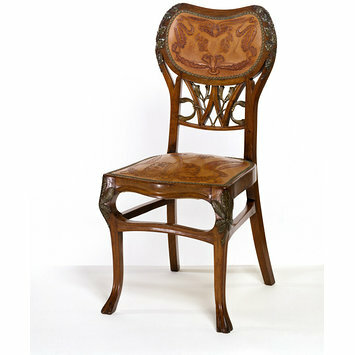 The front legs are slightly cabriole in shape, the knees carved with chestnut leaves in relief, painted green. The legs are joined at a high level by stretchers on the front and sides. The uprights of the back are carved on either side of the leather panel with trails of ivy. 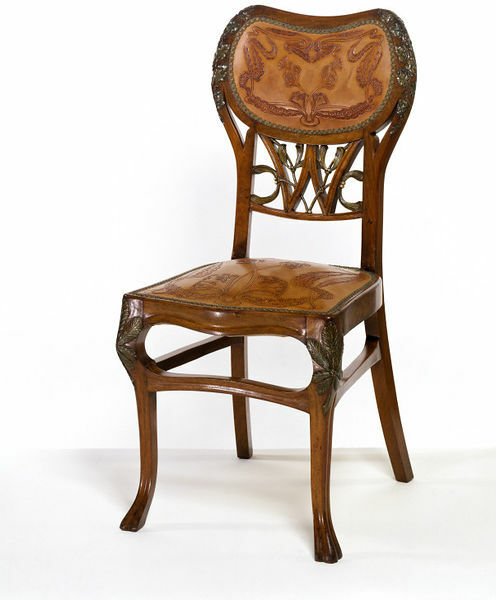 Below the leather panel the back shows a pierced panel carved with mistletoe sprigs entwining the letter W.
Chair, carved walnut, the leather upholstery new, but based on the original; French (Paris), A. Darras 1888-1900.